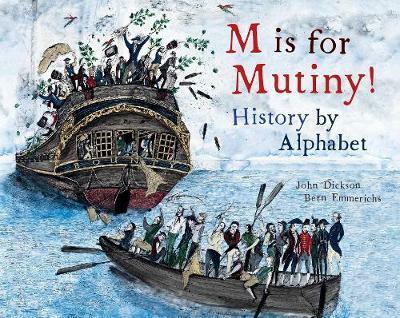 M is for Mutiny! History by Alphabet is a taste of the intriguing history of Australia and the many entry points for children to explore further. Why did Sir Joseph Banks hate bananas? Did anyone like William Bligh?? Where is Yemmerrawanne? John Dickson is a graphic designer and a copywriter by trade, a painter and poet by inclination and the lead singer of the Rolling Stones in his own mind. Always has been. Bern Emmerichs is a highly celebrated artist in Australia. Her works are in the Australian National Gallery, the National Gallery of Victoria and collections all around the world. Bern Emmerichs is renowned for her work which explores historical narratives of Australia's First Settlement.